With apologies to the great Irving Berlin and his lyrics from Annie Get your Gun. For a gal who he thinks is fun. Oh you can't get a man with a gun. 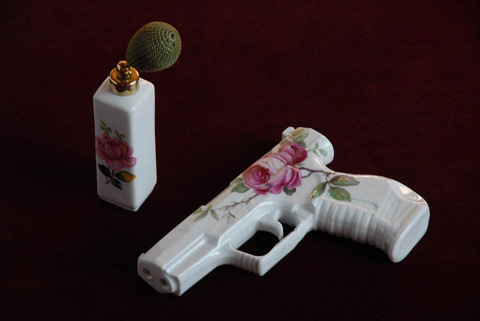 Berlin Artist Yvonne Lee Schulz is putting Annie Oakley's words to the test with a series of hand-painted, porcelain pistols. While it's true they are tableware accessories, there's a lot going on here and what she has to say about gun violence isn't meant to comfort. 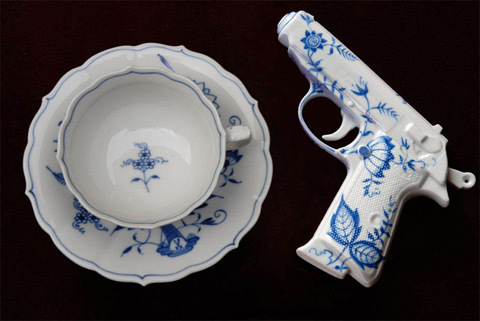 The Porcelain Pistols are replicas of James Bond’s Walther PPK and its contemporary sister, the P99,with friendly permission of Carl Walther Inc.The fragile weapon, hand-painted in the style of classic tableware motifs, liesnext to your coffee and cake, asking to be picked up. Its coolness andcomfortable grip increase the qualms of the user, leaving him in a quandary between the pleasure of luxury and violence. 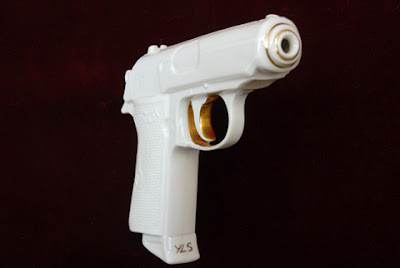 Just as was the case with the graffiti china and china beer cans I've written about before, the heads up about these pistols came from the great David Nolan and his razor eye. I love the idea of statement art being disguised as an everyday object and I would kill to see a tablescape blogger get her hands one a couple of these babies. What do you think? Too confrontational or not confrontational enough? Those are child's play. Where are the chainsaws? Too Sweet to Kill is confrontational. The Porcelain Pistols are too pretty and the message is lost about violence is lost in the faithful ceramic representation. Chainsaws would carry the same punch I think and wow Jane, Too Sweet to Kill is a kick in the teeth. I like this woman's perspective. 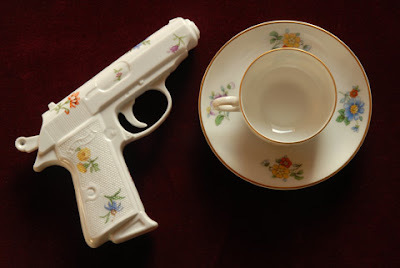 Not something I would expect to see at an English tea party --but definitely at El Dia de Los Muertos. I love the irony in Mexican culture that celebrates the macabre with decorated skulls and such. This reminded me of the movie Sin City with Antonio Banderas where he's talking to the cook about finding the cook so he can shoot him so that 'such a wonderful meal' cannot be repeated. And then, there's the song Pistolero by Juno Reactor that also came to my mind looking at these delicate beauties. They would make for an interesting addition to a Dia de los Muertos dinner. I never thought of that. I'd love to have a collection of these in different patterns to hang on the wall, reminiscent of my grand mother's spoon collection. I think that would be more interesting than on the table like they are in the pictures. I don't know, I kind of like seeing them scattered about like that. They would certainly make for interesting conversation. As for any quandry, I suppose it would depend upon an individual's perception. And that my dear is the whole point of this woman's art. To get people to react and discuss what they see. Do they "shoot" bubbles? That would be sweet! Hmmm I wonder if Ms. Schulz would be willing to take that extra step? Late to the party, but would love to own the first one, Blue Onion, Blue Danube (?) piece. 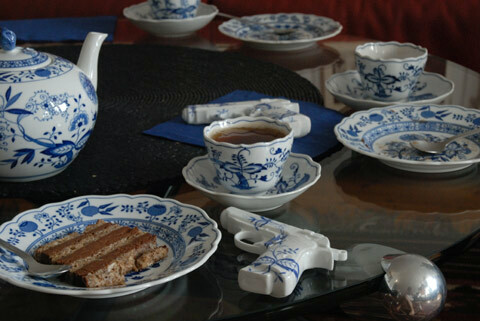 It would go with my Blue Danube china! Did Madonna ever get this kind of treatment? Live! 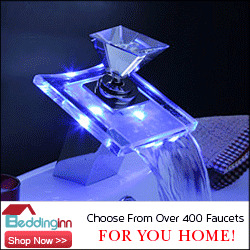 From London's Decorex! It's Johnny Grey! Interactive stairway lights --how cool is this? Late summer re-run: This is whack!